Although this topic was covered some years ago on this forum, the pictures have disappeared and none of the links work. So, I have started this new thread. The Principality of Atlantis was the invention of Aage Johannes Larsen from Denmark. He emigrated to the United States, firstly in 1899 and then, after returning to Denmark twice, again in 1911 and 1912. Through a process of anglicising his name and the adoption of the surname Mott (only possible in Denmark by Royal decree which was duly granted) he became known as Captain John Larsen Mott or simply Captain J L Mott. In the early 1930s he started his Atlantis project with the invention of the Principality of Atantis which consisted of several islands, never formally identified by him, but based on Plato's lost island of Atlantis. They were produced both imperforate and perforated 11.5 or 12 in sheets of 120. The values are 5 skaloj in blue on light blue, 10 skaloj in orange on light orange, 25 skaloj in dark orange on yellow, 50 skaloj in carmine on buff, 1 dalo in purple on light purple and produced a little later the 75 skaloj ingreen on light green. The perforate version of the 5 skaloj has a white background. The person depicted on the stamps is Mott's mother Marie, Anne Marie Jorgensen, appointed queen. Some covers were produced but these are rare. At the same time a series of triangular stamps were produced. 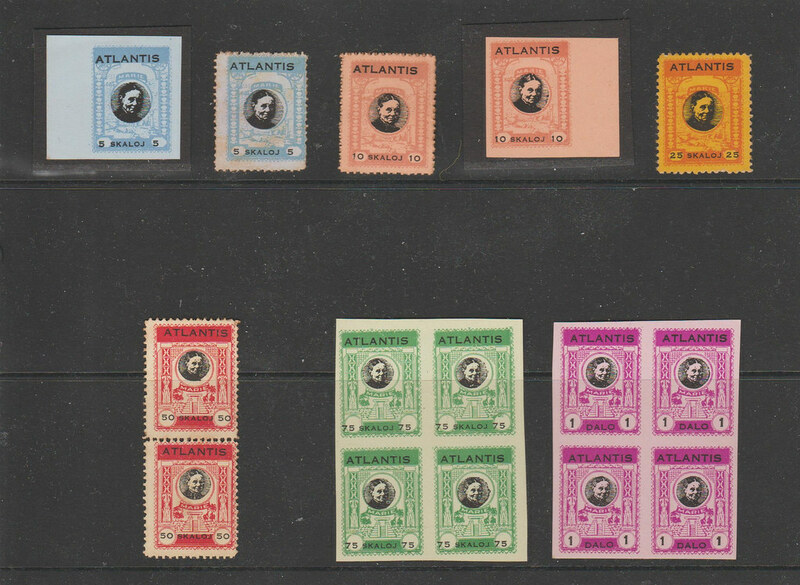 The stamps depicted were later overprinted for other fictional lands of Lemuria and Mu and a new set of 7 stamps was produced in 1938, probably rare. Mott is thought to have died in 1956.